Mobile point-of-sale (mPOS) allows for accepting payments from bank cards wherever you like: upon delivery, during any events, or at the counter. 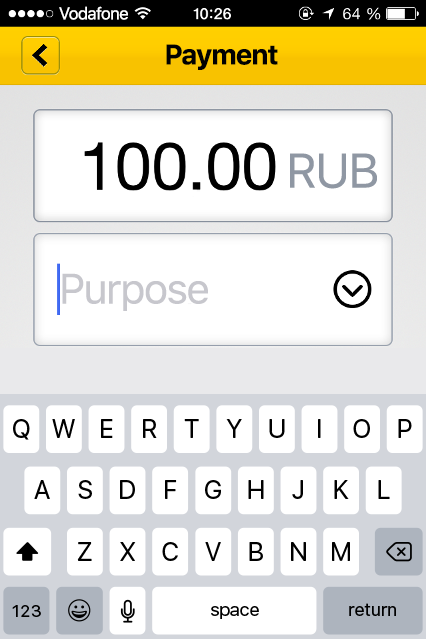 mPOS consists of your smartphone and a card reader, which you can buy from Yandex.Checkout (if you're signed up). You can order a reader after onboarding with Yandex.Checkout. First, fill out an application for a mobile terminal. In this application, specify groups of products and services you are going to accept payment for using the mPOS: for instance, 'flowers delivery' or 'taxi service'. Then print out, sign, and seal it. Use "Application for a mobile terminal" and your shopId as the subject. In the email, specify how many readers you need and the most convenient way for to get them: delivery by Russian Post or pickup at a Yandex.Money office (specify the city: Moscow, Saint Petersburg, or Nizhny Novgorod). Add a scanned copy or photo of your signed application. The Yandex.Checkout manager will send you an invoice for the terminal in response. You will need to transfer the money from the settlement account of the company connected to Yandex.Checkout. You can either get it by Russian Post or collect it in our office. You can choose what suits you best when ordering the reader. courier — courier's reference for accepting the reader. The reader is kept in the office for two weeks. As soon as we send the reader, we will send you an email with the track number: you will be able to track the shipment on the website of the Russian Post. Delivery term depends on the post service. The post service keeps the parcel in the post office for 30 days. C14 and C15 were sold until June 2018. P17 is on sale now. That's why we have two separate instructions. Each of them explains how to activate the terminal, how to accept payments, and what to do in problematic situations. Commission is 2.75% of the amount of a successful payment, charged to the seller. If a client pays 1,000 rubles, 972.5 rubles will be credited to your company's account.